You do not have to create an account to submit something. However, if you would like to stay notified on the issue or expect to submit more in the future, I would recommend creating an account. 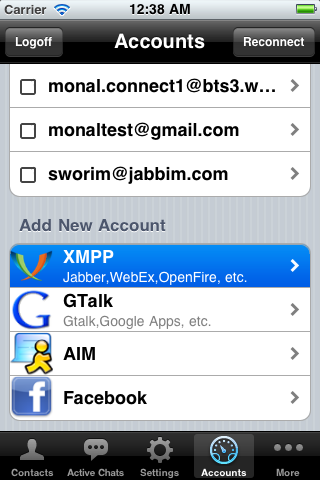 Openfire, Jabberd, ejabberd,prosody etc are all standard XMPP (Jabber) servers. When setting up a standard XMPP/Jabber account, select XMPP in the Accounts tab. 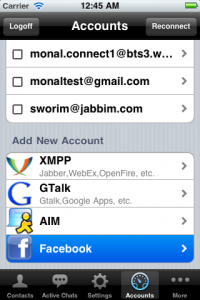 In the account set up screen first try entering your username under Jabber ID. The username is almost always like an email address and would look something like user@domain.com. Enter the password and enable the account. After saving and returning to the accounts page Monal will try to connect. For simple configurations with one server and domain this will automatically work. If this does not work, edit the saved account by tapping on it in the Accounts tab. Scroll down and look at the Advanced Settings. It is highly recommended that you check with the XMPP server administrator to determine what the server, port and SSL settings should be. The resource does not matter. Manually enter the new server name and port and enable/disable SSL. Save by returning back to Accounts. Monal should now correctly connect. 1. If you are not sure about the SSL setting, try once with it on and off. if it works with both, always turn SSL on if it works. 2. The port is almost always 5222. Some SSL systems require 5223. Normally it is never 5223 unless SSL is also enabled. Facebook chat is possible after creating a Facebook username. If you haven’t already done so, go to http://www.facebook.com/username and create a username. 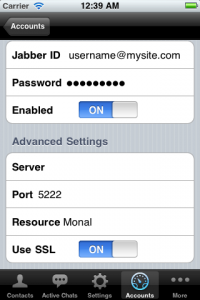 In the following page, enter the facbeook username under Jabber ID and password and enable the account. The Jabber ID will always be in the form facebookusername@chat.facebook.com. The password is the regular facebook password for the account. Leave all other settings alone. When first logging in, it is possible Monal will be slower on older iPhones as it downloads all the pictures for every facebook friend who is online. This is only happens on the first login.